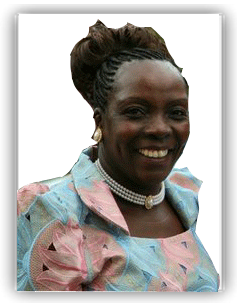 Margaret Apudo is the current CEO of Fathers Hand Limited (FHL). Between 1973-1976, Margaret earned her first degrees at Nairobi University, Kenya, graduating with honors on the disciplines of Sociology, Criminology, History, and Geography. Margaret then went on to further her education at Syracuse University, New York, USA where she was admitted for the MA program in Sociology, Criminology, and the Social sciences. Later on she was awarded a Fellowship for her Ph.D. coursework in the Social Sciences and Afro- American studies. Upon her return to Kenya, she worked as a welfare officer and lecturer in different prisons in Nairobi. She retired from the prisons in 1987 and worked as an administrator at International Faith Outreach Ministries. In 1990, she joined Daystar University as a lecturer in Community Development, where she was eventually promoted to a senior lecturer. She was responsible for developing the Community Development program in Daystar from a minor to a fully fledged Department. In 1996, she left Daystar and traveled to the U.K for further studies. She lived in Oxford, England for seven years and worked part time with different organizations. She also had the privilege of working for an organization by the name of Asylum Welcome. She worked as an Immigration Advisor and Family Worker. During this period, she received extensive training in Immigration Advise and Family work. She then relocated to the U.S. for five more years, and finally returned to Kenya in 2008 where she registered the Father’s Hand Limited Company. She is assisted by a result driven team that will ensure competent, reliable, and efficient service to clientele. Upon her return to Kenya, Margaret came across multiple expatriates facing frustrations of failed attempts to obtain the immigration documentation required to sustain their legality in Kenya. Having lived abroad where immigration systems are known for fast and efficient services, Margaret easily empathized with the expatriates facing the immigration systems in Kenya which are unfortunately dubbed as inefficient and bureaucratic. Her immigration background enabled her to successfully assist her expatriate friends in need. As more expatriates approached Margaret for her help, she decided to open an Immigration Agency within FHL. FHL has assisted, within short periods of time, numerous individuals whose applications have been stuck in the immigration process for over 5 years. Margaret believes in professional, fast and efficient service, which she is proud to state, is true of FHL. She is assisted by a result driven team that will ensure competent, reliable, and efficient service to clientele.